On May 29, 2005, we welcomed our son, Braden James, into the world. We thought we had welcomed a perfectly healthy baby boy into our family but about 24 hours after his birth all that changed. At one day old, Braden was diagnosed with Hypoplastic Left Heart Syndrome (HLHS). HLHS is a congenital heart defect where the left side of the heart does not form properly. Our tiny baby boy would require surgery to survive, and not just one surgery but a series of three open heart surgeries. At two weeks old, Braden underwent his first open heart surgery, the Norwood, at Children’s Hospital of New Orleans. His recovery took 6 weeks and we were finally able to bring our son home on August 1, 2005. Life resumed some normalcy until December 2005. Braden’s second surgery wasn’t scheduled until January, but his little body decided it could not wait any longer and the second surgery was needed now. We were admitted to Children’s Hospital the second week of December and Braden underwent his second open heart surgery, the Glenn, at six months old. Braden bounced back this time in only a couple of weeks, and we were able to be home for Christmas, with just a few days to spare. As a toddler, Braden underwent some physical and speech therapy, but otherwise he was a happy, rambunctious toddler who you probably wouldn’t have guessed only had half a heart. In November 2007, we traveled to Boston Children’s Hospital and Braden underwent his third open heart surgery, the Fontan, at 2 1/2 years old. Once again we were blessed with a complication free recovery and were able to travel back home just two weeks after surgery. Since his last surgery in 2007, Braden has done amazingly well. He actively participates in sports and is making the honor roll in junior high. He is looking forward to trying out for the junior high basketball team this upcoming season. In 2017, we were introduced to Hunt with Heart and Braden was invited to the first Camp La Pesca. Camp La Pesca was an amazing weekend of fishing that Braden will never forget. Braden has also had the opportunity to travel to Gary Yamamoto’s ranch in Palestine, TX for a weekend of fishing. 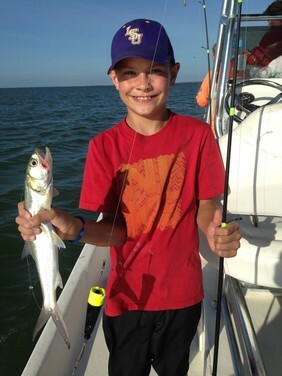 Once again this was an experience that deepened Braden’s love of fishing and being outdoors, things that he will definitely take into adulthood. We are so thankful for the opportunities Hunt for Heart has given our son thus far, and Braden is excited at the possibility of future outings with Hunt with Heart.